Jeremias Benjamin Richter was born on March 10, 1762 in Hirschberg, in Silesia, then part of Prussia, but now part of Poland. 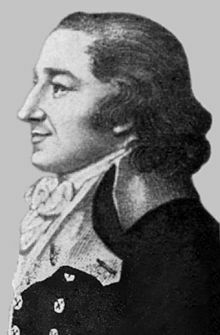 He became a mining official in Breslau in 1794 and in 1800 was appointed assessor of the Department of Mines and chemist to the royal porcelain factory in Berlin. He died in Berlin on April 4, 1807. Richter is most remembered for deducing the law of equivalent proportions. The law of equivalent proportions states that when two or more elements are combined, the weights of these elements are proportional to their equivalent weights, so as such the two are related. This concept, that elements combine in definite ratios to form compounds, is the basis of stoichiometry, a word coined by Richter to describe, "the art of chemical measurements, which has to deal with the laws according to which substances unite to form chemical compounds". This discovery hinted at the existence of atoms, which today we know combine in definite ratios to form compounds. At the time Richter's work was largely ignored due to his obscure and clumsy writing style and his emphasis on mathematics, which chemists at the time were not interested in. His discoveries were wrongly ascribed to Carl Wenzel and it was not until 1841 when Henri Hess gave Richter proper credit.